Costa Rica is Central America's jewel—a green jewel held in an ocean blue setting. For such a small country, the diversity of landscape is nothing short of astonishing! This rich oasis boasts thick jungles, rushing rivers, towering volcanoes and misty cloud forests, not to mention thousands of species of wildlife, making it one of the best places in the world to experience the tropics. Whether you are seeking adventure or simply looking to rejuvenate amidst breathtaking scenery, Costa Rica will reward you with a memorable vacation. Eco-tourism at its best. You can't beat Costa Rica as a vacation destination. The weather is perfect. There are an abundance of lodges and hotels that appeal to every taste, style and budget. And tourism in Costa Rica is well-established, so you can see the sights and still feel safe. Get into nature! One of the most impressive things about this country is its profound commitment to preserving natural resources. 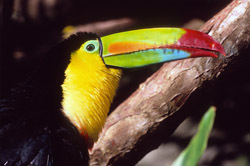 Costa Rica's parks & reserves are inspiring—with their wild cats, monkeys, sloths and parrots. This country has over 1200 different types of orchids and more butterflies than the entire continent of Africa! There are 25 Costa Rican National Parks, including the famed Arenal Volcano, and dozens of other protected areas like the renowned Monteverde Cloud Forest Reserve where bird-watching inspires awe. Tour by region. Every region in Costa Rica offers something uniquely special. Transportation in Costa Rica is easy, so you will want to study the map and plan a trip that allows for some exploration. Here, you will discover the best attractions. Find exceptional experiences on our list of must-do activities. 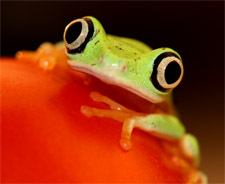 Once you learn more about Costa Rica, your curiosity (and heart) is sure to be captured! There's so much to do! Of course Costa Rica is known for outdoor adventure and provides exciting opportunities for visitors of all ages. Here's your chance to go ziplining… or bungee jumping… or whitewater rafting on Class II-IV rivers. But Costa Rica also has some great museums. And a growing number of world-class golf courses. Relax at one of the yoga retreats. Work hands-on to help endangered sea turtles. Or tour a plantation that grows that delicious Costa Rican coffee. Nestled between the Pacific Ocean and Caribbean Sea. Costa Rica has two coastlines of lushly tropical flora and pristine beaches. With so much wild shore, it's no surprise that this country offers first-rate surfing, exceptional boat tours and lazy hammock days. Go sea kayaking. Take a stroll on an isolated beach. Snorkel or scuba dive among brightly colored tropical fish. And at day's end, simply kickback and enjoy the serenity of a panoramic sunset over a shimmering horizon. Come right in, sit right down. The Costa Rican culture is one that puts great value on hospitality, education and community. With a 93% literacy rate and high standard of living, people can choose their field of work and dedicate time to arts, sports and festivities. And, since tourism is a major industry, visitors receive great care and assistance. Costa Rica. An Exotic Travel Vacation Experience.